Welcome to TSX vs. the World, a new recurring series where I compare my 2009 6-speed TSX head-to-head against other random cars. The first of these involves another late model midsize sedan, a friend’s 2014 Ford Fusion SE with the 1.5 EcoBoost. It was a cold, drizzly day on the outskirts of Richmond, probably not the best time to do a car comparison test, but our schedules rarely have us off at the same time and this was the first time in months that we were both free the same day. 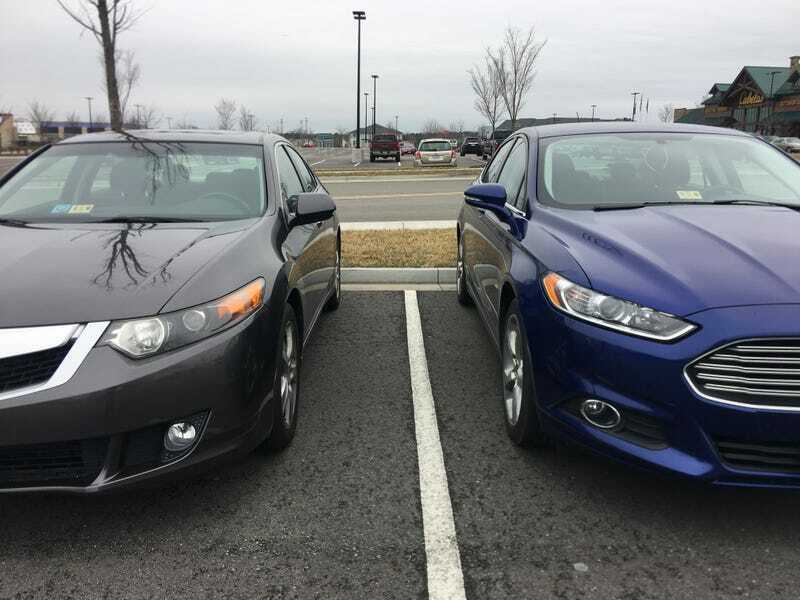 Our cars are pretty similar: both midsize sedans that cost in the low five figures on the used market, 4 cylinders, FWD, and grilles that are, uh, distinctive. As we learned over the course of the afternoon, the two cars have different personalities. Yeah, one is meant to be a luxury car and the other isn’t, but used examples are close enough in price to be cross-shopped, and they were both sold new in 2013 and 2014. We first set off in the TSX, where I threw it around some back roads. My car is a manual, as I’ve said before, and I imagine it wouldn’t be as fun if it had the automatic due to not having as many gears. Why Honda/Acura thought a five-speed automatic was cromulent on one of their finest cars in this decade is beyond me. After stopping for gas and continuing on the back roads a bit more, we returned to the parking lot where we’d met and switched to the Fusion. It’s an automatic car. Like the TSX, a manual was available on the Fusion in 2013 and 2014, but rarely sold. At the time the car came out, only four-cylinder engines were available, with the TTV6 Fusion Sport not coming out until 2017. The base engine was the 2.5 Duratec, which came in the S (for Slow) trim. The SE and Titanium trims got EcoBoost engines ranging in sizes of 1.5, 1.6, and 2.0 liters. There was a noticeable difference in how the car behaved and felt. The Fusion is less comfortable and a bit louder. The engine is, of course, a bit torquier with the turbo, but it starts falling flat on its face in the middle and high RPM ranges when the TSX’s K24 is thriving. 0-60 times end up being about the same. The automatic on the Fusion has an extra gear, and it’s a bit more fuel-efficient than an equivalent TSX. We drove around Richmond for a bit, eventually winding up outside Japanese Classics, where they had several cars outside that weren’t listed on their website, including a Beat and a JZX90. We didn’t go in, obviously. After some more driving, we stopped for lunch and happy hour. The beer was a bit watered down, but still not bad. Once we were good to drive again, we switched back to the TSX and did a highway run. By then the sun was setting, so after finishing that we went our separate ways. So what was my verdict? The Fusion is a good car overall, but I still prefer the character of the TSX. The smoothness, the nicer interior layout, the extra amenities (although the Fusion has a backup camera, which the TSX only got on the Technology Package), a real parking brake. The Fusion does have AWD available, though, which the TSX did not. Conversely, you can’t get a Fusion wagon in the US, while TSX wagons were sold from 2011 to 2014 (albeit limited to the 4-cylinder/auto combo) and are creeping down into the $12-13k range. But they’re still both solid cars.